I first became aware of the One Room Challenge sponsored by Linda of Calling it Home last spring. The April Challenge was going on during the time I was redecorating our den, and I enjoyed reading along with many of the bloggers as I went through my own process over a longer period of time. I decided then that I wanted to participate in the October challenge. The room over our garage, which we refer to as ‘the office,’ hasn’t been used as an office for over three years. It’s become a bit of an attic space, storing ‘all that stuff we don’t know what to do with but just can’t get rid of and don’t want to put in the real attic’. When I found out about the 6-week long One Room Challenge, I decided this was the perfect space to focus on. The defined time span will be difficult, but it will be great motivation to work quickly to achieve my goal. Warning: This week’s post is heavy on words and light on photos, but I promise future weeks will feature more pictures! In all honesty, I started working on this 6-week challenge over 6 months ago without realizing it. In February, I spent about 10 days working to clear out some of the clutter as we prepared for a yard sale in March, which was pretty successful and helped us get rid of a lot of ‘stuff’. Even more stuff was donated to local thrift stores, and a lot was tossed. Most of what filled the garbage bags was notes from some of our high school and college classes that we will never need. It was fun looking through it all, though, and I hung on to a few assignments that were memorable. During that time, we also got rid of some furniture we didn’t need anymore, like the two desks we had in the space (which remind me of Dwight Schrute’s Megadesk in the Office), and I moved an old nightstand into our guest bedroom so it could actually be used as a nightstand. There are still a couple of furniture pieces that need to be donated, sold, or moved to other rooms in the house. And tons of books, papers, old toys, and other belongings that need to be sifted through again before being organized and placed on the shelves. 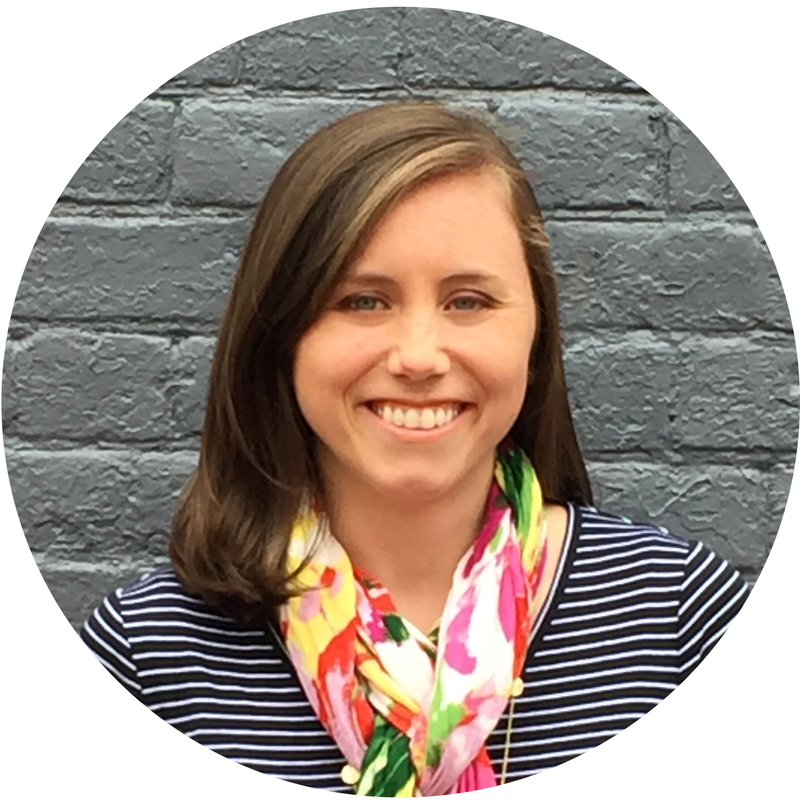 Temperatures hovered in the 50s in the office in February, so I bundled up. The little dogs helped keep me warm, too! We even settled on a paint color and I got started on painting one section of the room – but that only lasted for a few days. By that point, it was May, so the temperature shot up and it became unbearable in there. The window unit in the room hasn’t worked since before we bought the house, so it’s pretty uncomfortable in there from May-September and late November-early March. We’ve had a functioning window unit that the Mister’s bosses passed on to us a few years ago sitting on the floor, which we will finally use to replace the old one in the coming weeks. upstairs with me the night I started sorting through things. In my current craft/sewing room, there are supplies just waiting to be moved into their new home above the garage: fabric, thrifted clothes waiting to be refashioned, and art and craft supplies. But there’s a lot of work to do before it’s time to make that move! Once the One Room Challenge is complete, I’ll convert the sewing room into another guest bedroom. For whatever reason, it’s gotten difficult for me to function in that space (ok, I’ll be honest. it’s mostly the clutter). There are actually three work stations in there, but each one has its limitations. One is really too small for me and my computer to easily fit. The second is my beautiful antique sewing table that was really meant for someone much shorter than I am, so I’m always banging my knees on it, and it won’t function well as anything but a sewing table. I happened upon a yard sale one rainy day in 2009 or 2010 and found this beauty for $40! The last is a giant desk we made by putting a large sheet of plywood over my cube shelves from Michael’s. I absolutely love it. It’s meant to be used as a fabric cutting and craft table, but winds up usually serving as a desk and is covered with desk items instead of being kept free for larger sewing or craft projects. It’s where I cleared off a small space to paint and assembled the Mister’s birthday present a couple months ago and where I’ve worked on a few other scrapbooks and sewing projects over the years. The main downfall of this piece is that when I stand at it to use it as a table, my back starts to hurt because it’s so low that leaning over it for any extended period of time just isn’t an option for me. Here it is the day we assembled it…I haven’t seen the top of it since!! Also, the room has gotten so cluttered over the past few years that I feel a little lost – I’ll go in with the intention of working on Project 1 but then I see materials meant for projects 2-17 and I just get overwhelmed. I wind up blogging in the kitchen or on the couch, and they’re just not the most productive spaces for me since they’re both in the middle of the action in the house, and I can see dishes in the sink and other messes that should get my attention, distracting me from actually sitting down and working. Here are some images of what the sewing room looked like in January, and not much has changed in the past 10 months…this is a bit difficult to share, but it seems necessary! The last – but of course, not least important – factor in my plans for the office is the Mister, who works from home on occasion. Since the ‘office’ became the second attic, his at-home workspace has been the kitchen table. In the event that I’m cooking or cleaning or working in the kitchen and he’s trying to work at the table, it winds up distracting him and slowing me down, which doesn’t work for either one of us. Last, the kitchen table has turned in to the landing place for all of our mail, papers I need the Mister to look at, my grocery lists, new magazines that I haven’t had time to read yet, and more. So a useable office space is really going to change things for us. I can’t wait to have the separate space to work in, for the Mister to have a space to use when needed, and for the kitchen table to once again be a kitchen table. Primary goal: To create functional work space with less clutter. My main goal for the One Room Challenge is to create a multifunctional space that we can both use, with multiple work stations, and a chair for reading. This room must be able to function as both an office and a sewing/craft space, provide lots of storage, and display a variety of items on its shelves. In addition to storing fabric and magazines, the shelves will serve as a bit of a ‘museum’ of mementos and accomplishments from our childhoods, and as a library to store the books we’ve accumulated over our lifetimes that we would like to hang on to. As I mentioned before, I painted for a few days back in May, and I’ve been working on it again for the past week, but it’s a big job. Those shelves are no joke. Also, the options for removing and painting the handrail in the staircase are limited because it’s too long to move to the garage without opening the window in the laundry room and removing the screen so we can back it out of the staircase, then move it forward into the garage. The easier option will be to just take it upstairs, but that means I have to clear out a space for it first. I’ll most likely spray paint the hardware with a brushed nickel spray paint since that should look pretty good with the gray walls. For the handrail, I’ll probably go with white paint instead of a darker stain so it matches with the rest of the white trim – and it will be a quicker process than staining it. Last, I’ll paint the funny mini door to the small attic closet in the corner of the room. I’ll either use the same white paint I’ve used everywhere else or a chalkboard or magnetic paint. 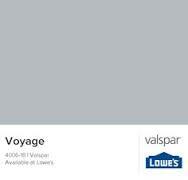 The paint we chose is Voyage by Valspar, but I had it mixed in Sherwin Williams paint to save a few dollars. I have completed one wall, and I love it. It’s a blue-gray, which I prefer to a tan-gray, and I love the contrast between the gray and the true white I chose for the shelving and trim. I love it so much I kind of want to paint the whole house gray when I’m looking at it (I won’t, though!)! This is a neverending process. I have trouble getting rid of things because I form these funny little emotional attachments to all kinds of things, whether it’s a drawing I did in the second grade, a favorite shirt or dress from sixth grade, or all those Teeny Beanies I collected from my Happy Meals. There’s no reason for me to keep them, but I just can’t part with them (some might call that hoarding…), partially because of my emotional attachment and partially because I worry that it just turns into junk in a landfill or junk on the Goodwill shelves. And if it’s going to be junk on the Goodwill shelf, someone like me might come in and buy it to reimagine it into something else…and if that’s the case, then I should just keep it and do that myself! I’m working through this, though, and am getting better at sorting things into Keep, Donate, Sell, and Trash categories slowly but surely. We met when we were sixteen and running cross country for our high school. Since then we have continued to run in local races, and we have lots of race bibs, plus medals and plaques that we’ve earned over time and would like to display, so I’m excited to execute the plan I came up with over the summer. It only exists in my head, so there are no photos to share! We were both in scouts growing up and went all the way through to Eagle Scout (the Mister) and Gold Award (me), so we have sashes, badges, and other items marking achievements from those organizations that we would like to put on display. Last would be our collection of books – some are college textbooks that we hung on to, others are books we had as children, and others have been accumulated since we got married. The first piece of furniture that will go into our new office space is a pretty antique desk I found at a thrift store over a year ago and has been sitting in our garage ever since. It needs some attention before it’s ready, but it has a beautiful shape. $15 because I knew the desk had been there for a few weeks. I’ll leave my lovely sewing desk behind as a nightstand in the old sewing room, which will become a guest bedroom. Instead, I’ll use one that my friend gave me. It was her mother’s and grandmother’s and she’s not interested in sewing so gave it to me. It’s much larger so will be more comfortable to sit at and will provide more work space. The next piece of furniture, which is the third work space, is the new craft table that I’ll make from the plywood sheet from my current craft table/desk. To make it taller, I’ll put the plywood sheet on top of two ~36” high shelves. This will allow me to stand at the table without leaning over and will prevent my back from hurting!! We have an extra barstool that had to be taken out of the den when we got the new couch in March, so it will serve as a seat for the new craft table. At some point, I will probably cover the seat with different fabric so it will fit in with the room better. I’ve seen many different versions of this desk on Pinterest, but this is one of my favorites. The other two more major pieces of furniture will be a plant stand in front of the window and a shelving unit made from the Michael’s cubes that form the base of my current craft table. I’ve discovered that the only place in our entire house I can keep a plant alive is in front of one of the windows in the office. Because of the tall trees around us and the direction the house faces, no other windows let in enough direct sunlight to allow a plant to thrive, so I plan to have a few herbs and a flower or two on a stand. I’m considering a couple different options for the plant stand and will decide which one I should proceed with after some of the other furniture is in place. craft storage shelf. The new cube shelf in the office will be similar to this one. The cube shelving unit above will be the primary area where craft supplies will be stored. It will go against one of the few wall spaces not covered by built-in shelves. Directly above it will be a large bulletin board, which I will eventually cover once I make a decision on fabrics. And maybe frame with crown molding. We’ll see. 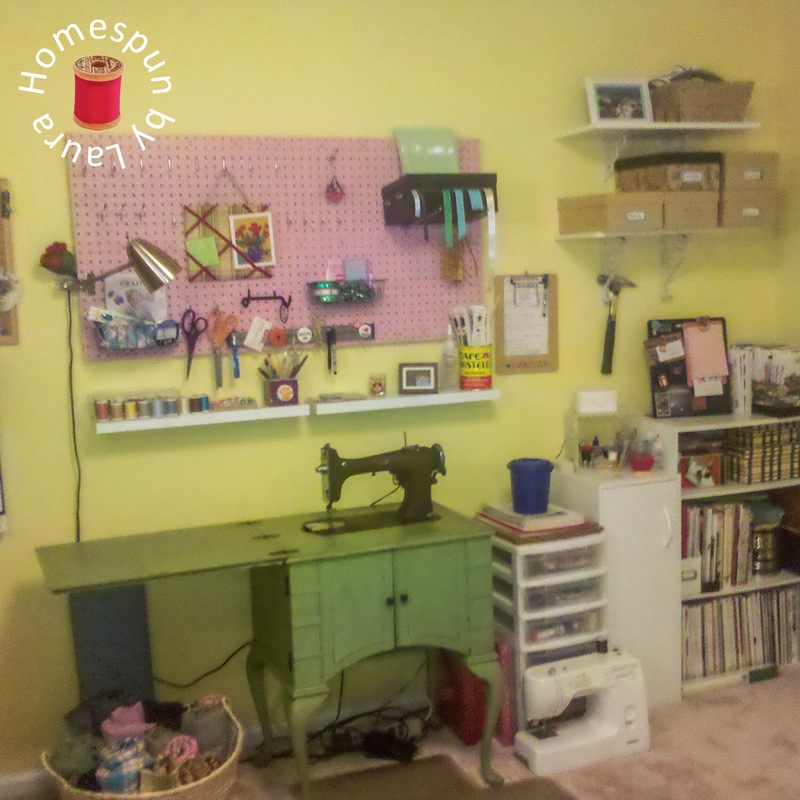 The same goes for the pegboard I’ll move from the current sewing room. It was an anniversary gift from the Mister about a year after we moved in. I had saved an issue of the Lowe’s Creative Ideas magazine featuring a cool pegboard craft station unlike anything I had ever seen (this was pre-Pinterest! ), and the Mister bought the supplies, then painted and assembled the thing as a surprise for me. It will probably be repainted, but since it was a gift from him, our plan is for him to pick the color. I’m considering framing it with molding, too. …but here’s the pegboard right after the Mister gave it to me. The clothes hanging in the refashion closet will move to a new rolling rack in the sewing room. My hope is that having them out and visible will help me to keep up with them – and not replenish them until there’s space to store new ones. All the fabric in my stash will be wrapped around small boards and stored on one of the built-ins where there is no direct sunlight to prevent fading. That’s a lot of refashionables! Last, to make it easier to move among different work stations and keep the surfaces free from clutter, I found a rolling cart at Sam’s a couple months ago that I’ll put my most frequently used items on. Probably the most important changes will include replacing the fluorescent lights (one of which doesn’t even work anymore) with ceiling fans, replacing the outdated light at the bottom of the staircase with a new one, and finally installing that new window unit, which will make the room useable year-round. The Mister will be a huge help with these as they are a bit out of my wheelhouse. It’ll be 100% fine with me if I don’t have curtains, pillows, and a few other décor items perfectly in place at the end of these 6 weeks. I want to make sure all the furniture and large wall hangings are in place before I make the final call on several décor decisions and will be making the curtains and any pillows myself, so the final touches may stretch a bit beyond six weeks. The plan is to use navy, turquoise/teal, and hot pink as accents in the gray and white room, and I don’t anticipate any changes there. I’ll most likely make Roman shades for the windows since I think full-length curtains would crowd the walls, but I’ll make that call when things start to get cleared out and I get the furniture in place. I’m using white frames in a variety of sizes to frame a few photos and paintings. The main area that I’ll be able to hang them will be on the walls in the staircase, where there are currently several posters the Mister bought during his freshman year of college and had in his dorm rooms before they wound up in our house. Most of them will be rolled up and stored for now, but I have a plan for showcasing two of his favorites so it feels like OUR space, not just mine, and I have one more surprise up my sleeve for him. For anyone who read this entire post, thank you for sticking with me. I hope you’ll check back in over the next six weeks to see the progress we’ve made! Wow!!!! You have big plans and a great to-do list. Really looking forward to seeing your space transform!